The second day of the conference was devoted to cross-disciplinary panels, and money was a consistent theme in both morning sessions as well as the luncheon. 3. turn down the assignment and let your answering machine talk to your creditors. If you take option #1 you risk losing your credibility, #2 can get you blacklisted, and #3 can get you broke. If it were a once-in-a-great-while kind of thing, it would be easier to say “take the high road.” (Can’t you hear your mother? “If you can’t say something nice, don’t say anything.”) But such scenarios are becoming not only more frequent, the lines are fuzzier and more imprecise. The panel on Ethical Traps explored some of the murkier waters. What happens when you are assigned to write a review and your editor is on the museum’s board of directors, or your editor happens to mention that The Publisher’s Wife is chairwoman of a charity fundraiser that is getting a percentage from the Fall season’s ticket sales? These are no-win situations because your motives will always be questioned. If you write a favorable review, people will wonder if you liked it, or didn’t but couldn’t say so. If you gave the show a bad review, somebody is bound to say that you were super-critical to avoid any appearances of favoritism. Norman Lear’s exhortation from the preceding day’s keynote speech would have us provide “perspective on how truthfully and skillfully creative works are speaking to power.” How can we, when Power is our boss (or a major stockholder)? Our mission is imperiled by the ever-increasing privatization of culture. Corporate sponsorship and individual patronage is not new, but it’s become more insidious as the “patrons of the arts” demand more and more control of the arts, all the while laundering their money and polishing their image. Broad rattled off statistics – 2200 Los Angeles-based visual and performing arts organizations, 105 museums, four of the best art schools, 705 musical groups, 220 theater companies, 60 film festivals… His point? Cultural tourists spend more money, stay longer, and visit more frequently than business travelers. Broad took some questions from the floor, but his answers were deflective. I guess he thought that arts writers would be thrilled to have more to cover. Our point? If you’re going to fund more art institutions, you had better fund some media coverage of the arts as well. What is our role as arts writers? To give voice, shed light, and draw attention. How do we navigate the murky waters to make an honest and ethical living practicing our craft? As best we can, with integrity, transparency, and full disclosure. Can art speak to power? Absolutely. Can arts writers speak to power? We have to. Last week The American Theatre Critics Association, The Dance Critics Association, The International Association of Art Critics, Music Critics Association of North America, and the Jazz Journalists Association held a joint conference in Los Angeles to discuss the state of arts coverage today. My first two lasting impressions from the conference both resonate around my love of narrative journalism. I know this was a conference of Critics, but, despite my being an opinionated soul, I have never defined myself as a critic. And although I was attending the conference as a card-carrying member of the Jazz Journalists Association, I don’t often call myself a jazz journalist either. I am happiest as a writer of true stories — narratives. Norman Lear gave the opening keynote speech, and even though it was full of the expected humor and political barbs, his message was serious. He bemoaned our society for “celebrating success regardless of quality;” contrasted Power, which “aims to anesthetize and retain,” with Art, which “aims to probe and startle;” and exhorted us “to give [our audiences] some perspective on how truthfully and skillfully creative works are speaking to power.” He spoke of artworks as the means by which artists “declare [their] individuality while affirming that [they] all belong to a larger family of man,” and he wants us to help our readers “recover a sense of emotional and moral complexity in human affairs.” This was a call to arms perfectly suited to a narrative journalist. Those are my goals as a writer: to celebrate life, to illuminate the lives and loves of people around me, to do so with skill as well as passion while creating works that are entertaining. And so I begin to comb my mind for memories of a perfect day, or if not perfect, then a day fully remembered, an important day. As I read on, I am surprised to find that Eiseley’s memory of his perfect day is totally lacking in the usual specificities. He doesn’t remember when it was, or exactly where, nor does he recall who was with him. Suddenly I realize that a memory need not be “an event” to be of importance, that a beginning, middle, and end are not requisite. Thoughts and feelings, moments recalled and perhaps savored, even if seemingly disjointed from time, these are what illuminate a life. Freed from some unspoken and self-imposed constraint, my childhood mind opens and I smell the chlorine at the Leroy Street swimming pool where my dad and I went swimming, the incense wafting from every doorway on Greenwich Village’s Eighth Street in the 1960s, the burning wood and singed marshmallows of summer camp fires. I feel the heat on my chest from mother’s Vick’s VapoRub cures, the ache in my ankles after hours at the ice skating rink in Central Park, the exhaustion following a marathon at the Folk Dance House. I taste the cinnamon in mom’s rice pudding and an oyster from my grandfather’s plate. I hear my father reading Charlotte’s Web aloud and my mother singing to me to sleep. What memories and musings will find their way into a manuscript remains to be seen. Meanwhile, I will keep conducting an ongoing self-interview, aided, in part, by questions that I see other writers pose to themselves. These are the opening lines of Walt Harrington’s introduction to “At the Heart of It: Ordinary People, Extraordinary Lives” a beautiful collection of portraits from everyday life. 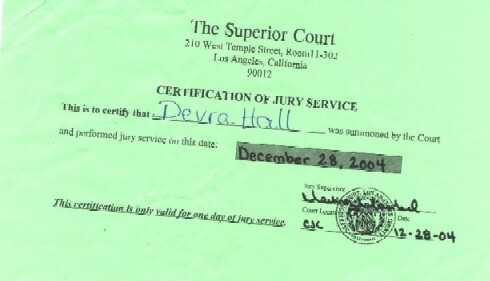 For some reason (probably the instincts of a pack-rat journalist), I had saved my Certification of Jury Service, along with two tri-panel brochures – “Trial Juror’s Handbook” and the “Where-to guide for Jurors on their lunch hour in Downtown L.A.” – a page titled Juror Orientation and a Notice to Jurors Regarding Postponement, Financial Hardship and Possible Service at Other Courts. Now I remember. I was going to write about this. Why? Because when the day was over I was surprised to find myself actually looking forward to being called again, and slightly disappointed that it would be at least a year before that summons would come. You’re surprised? So was I. In Los Angeles, you are notified of the week that you must be available, but you get to phone in each evening to see if you are needed the next day. If you are not needed, you do not go in, and if you do have to go in but are not appointed to a jury that day, you are excused from service until your next summons a year or more later. In short, unless you begin a trial, you never have to spend more than one day in the court house. The first night I had called in to find that I need not report the next day. I congratulated myself on my decision to not try and extricate myself from serving – a decision based not on any desire to serve, but on my own conviction that nothing would be happening in the court house during the week between Christmas and New Year. I was wrong. The next evening a recorded voice informed me of my 7:45 AM call time. The weather was predicting major storms and, given the fact that rain was already coming down in sheets, there was no room for doubt or hope. The drive into downtown on the oldest freeway in Los Angeles, a narrow curvaceous ribbon with lots of flood-prone dips, was truly terrifying, even at fifteen miles per hour. After puddle-jumping through the three blocks from parking lot to court house, placing my soaking wet belongings on the security scanner conveyor belt, and following the crowd down long hallways to and from the elevators, I took a seat in the Jury Assembly Room. No one wanted to be there and everyone knew it. The orientation spiel was well-scripted. By now they know exactly what to tell you, and they answer all the questions one might have before anyone needs to ask. Then, one of the judges came in to address the prospective jury pool. He was extremely dapper, wearing a three-piece suit that looked more like a frock coat than a banker’s suit. He asked how many of us were happy to be there, and two people raised their hands. (At least we were an honest bunch.) Then he asked how many of us believed in the right to a trial by a jury of ones peers; of course everyone raised their hands and his point was made. He then spent a few minutes actually thanking us for being there. That’s when my attitude, and the attitude of many others, began to change. Judge Frockcoat has made a very positive impression. Around 10 AM, a disembodied voice called thirty-five names, including mine, and sent us up to Department 126. The bailiff came out to give us juror numbers and ask us to wait in the hall. We had been told that the case was expected to last two days (not counting jury selection or deliberations), and by this time I was psyched – properly prepped and primed to do my civic duty. I had already figured out how to postpone whatever other obligations I had for the rest of the week and next. And I was not the only one who was now eager to be impaneled. But after about fifteen minutes, the judge himself, still robed, came into the hallway to tell us the lawyers had just settled, and then he thanked us for being there ready to serve. I spent the next hour and a half listening to a disgruntled retired schoolteacher, chatting with a building contractor, and solving puzzles. No, this is not some writerly metaphoria; the Assembly Room was well-stocked with 5000+ piece jigsaw puzzles that not only helped to pass the time, but also rekindled my love for a childhood pastime. Mercifully, the rain abated and, we were granted a ninety-minute lunch break. Having been provided with schedules for the twenty-five cent Dash buses and maps to shops, restaurants and sites that would do a visitor’s bureau proud, we dispersed to eat in China Town, shop in the jewelry district, and visit the new Cathedral of Our Lady of the Angeles. Two more juries were selected after lunch, but my name was not called. Shortly after 4 PM the voice let us know that we could go home. I traded in my badge for the green certificate, and headed for home. I was disappointed that we were not needed, and pleasantly surprised by both of the judges I had encountered. Do they teach you to be so nice and polite to jurors in judge-training? I ask mostly tongue-in-cheek, but there is a part of me that really thought judges were to be feared (yourself not included, of course), much in the same way as we fear the police. I even noticed a good feeling among the courthouse staff, a camaraderie that I thought was a figment of TV’s imagination a la Judging Amy. So what do you think, is this the norm? To sum it up, I would say what you experienced is becoming the norm. We are told at the judicial college that wearing the robe and just dictating won’t work today, you have to have a viable means of interacting with the public, which I’m glad about. With that said, however, we still have to maintain judiciousness and judicial authority, except that now, hopefully, the public will have enough information to respect, understand and accept the system…. One of the things I enjoy most about the position is the juror participation and my opportunity to interact with them. It’s the system at work. Enough said. Court is adjourned. One old adage told to every writer early on is “write what you know.” There are some pros and cons to such advice, but to me, “write what you care about” is a more important message. It is certainly not the most lucrative approach, but it is the most rewarding. I keep reminding myself of this as I send out book proposals about people and subjects that matter to me. When the rejection letters come in, I follow a three-step ritual. First I file the letter (more often a postcard or preprinted form) for future use – perhaps I will use them to wallpaper my bathroom much the way jazz saxophonist Paul Desmond used Christmas cards from the White House. Then I mail out a fresh copy of the proposal to another publisher. And finally, I remind myself that most authors’ proposals get rejected many times before they find a home; after all, that’s what happened with my last book. 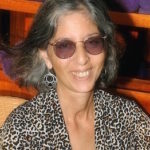 It was early 1997 when my mentor asked yet again, “As a woman of a certain age, are you sure that’s what you want to do?” Still fresh from the cancer wars, my future far from certain, a well-intentioned mentor thought that perhaps I should focus on something more lucrative, more commercial. A dozen years earlier, I began writing a biography of John Levy, the bassist with Billie Holiday and George Shearing way back when, who in the early 1950s became a trailblazing personal manager with a list of clients who were the cream de la crème of the jazz world. He was also a man for whom I worked and with whom I fell in love. I worked on this project, on and off, for many years. Research turned up recordings and lots of events that John did not even remember. I interviewed George Shearing, Dakota Staton, Billy Taylor and others to piece together John’s early years. Now I wanted to finish it. My proposal made the rounds, but because John himself was not “famous” and because it did not include “dirt” on all his clients, no one was interested…until, one night at a patron’s dinner, a San Francisco Jazz board member referred me to a friend of his, a publisher of a small press in Maryland. “Men, Women, and Girl Singers” was finally published in 2001. Dotard viewer and dotard review are just two of the many anagrams I found when plugging DevraDoWrite in at the Internet Anagram Server. Six months shy of my fiftieth birthday, I hardly qualify as a golden-ager or oldster, but I promise you that should my postings ever show signs of a “decline in mental poise” (Britannica’s definition of dotage), I will pull the plug. Still, I do find that this coming birthday occupies my thoughts more than any previous ones. It feels like a deadline or sorts – a time by which I should be able to mark some major accomplishment or achieve success, whatever that is. Perhaps a more apt anagram for me at this time of self-reinvention is vita reworded. While my life as an author began with computer books published in the mid-to-late 1990s, it is only in the last few years that I have found my raison d’etre as a writer: to tell the stories of people who make a positive difference in the lives of others. The people I find of interest are not A-list names and their stories may lack broad commercial appeal, but their contributions merit recognition. Some of them, such as Johnny Pate and Luther Henderson, worked with well-known musical artists, but others are just average folks like the parents and teachers involved in the birth of the middle- and high-school students marching band in Pasadena, California. I’ll be blogging about these and other people in future posts. Meanwhile, if I heed Arthur Schopenhauer’s words – “The first forty years of life give us the text; the next thirty supply the commentary on it” – then I have twenty more years to make good, and that should relieve this admittedly self-imposed birthday pressure.